Automatic paper inspection line with paper transport for multi-layer samples. Automatic and continuous measurements of single sheets from DIN A4 up to max. 10 layers of paper samples (depending on the basis weight 35-900 g / m2) of any length, with measurements of all parameters, at the same point. Automated offline verification of important quality parametres in the laboratory or at the side of the machine, a joint product of MRP Automatisierungstechnik GmbH and Schnettler Technologies. 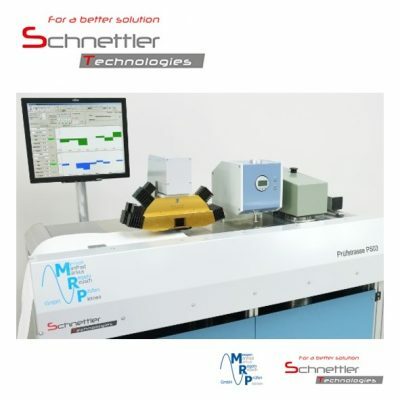 Automated paper test line with paper transport for multi-layered samples. Automated and con-tinuous measuring of single sheets from DIN A4 up to a maximum of 10 layers of paper samples (depending on the grammage 35-900 g/m2) of any length, with measuring of all parametres at the same point.